When you spend as much time online as we do, you think that every person who goes on the Internet watches online videos, at one point or another. Surprisingly, that’s just not true. 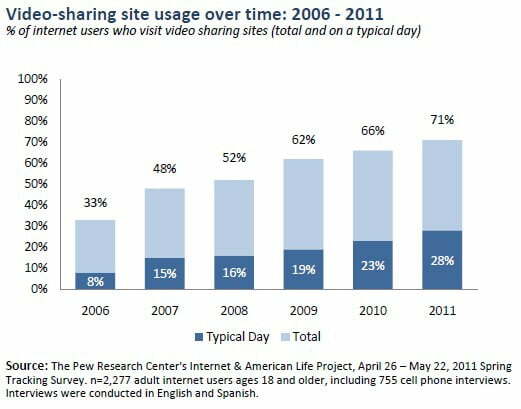 According to a newly released study from Pew Research, 71 percent of web surfers use video sharing sites like YouTube and Vimeo. That’s up from last year’s staggeringly low total of 66 percent, and 33 percent in 2006, the first year Pew polled such usage. In addition, Pew found that 28 percent of Internet users watch online videos daily, a major jump from the 8 percent who watched every day in 2006. Much of the growth in online video usage comes from rural Americans, who now watch Internet videos nearly twice as often as they did in 2009. This has also resulted in an increase in the number of white Americans who watch online videos, a total of 69 percent. That’s up 13 points from 2009. Despite these gains, however, online video usage among whites remains 10 percent lower than that of non-white Americans, amongst whom 79 percent partake in online video watching. The number of non-whites has also increased, from 67 percent in 2009 to 79 percent this year. The group that watches online videos the most is, of course, young adults: 92 percent of 18- to 29-year-olds reported online video usage. Other groups that most frequently watch include Hispanics (81 percent) and people who make over $75,000 per year (81 percent). Also, 81 percent of parents watch online videos, compared with only 61 percent of non-parents. This discrepancy, says Pew, is likely due to parents having young children at home who are more likely to watch online videos. The increase in online video watching is also due to a surge in new content, from both amateur and professional video-makers. More users has been a boon for online video king, YouTube. Since the end of 2005, YouTube has grown from 8 million views per day to more than 3 billion daily views. More than 200 million of those impressions come from mobile devices.